Welcome to the world of the sharp-suited 'faces'. The Italianistas. The scooter-riding, all-night-dancing instigators of what became, from its myriad sources, a very British phenomenon. Mod began life as the quintessential working-class movement of a newly affluent nation - a uniquely British amalgam of American music and European fashions that mixed modern jazz with modernist design in an attempt to escape the drab conformity, snobbery and prudery of life in 1950s Britain. But what started as a popular cult became a mainstream culture, and a style became a revolution. In "Mod", Richard Weight tells the story of Britain's biggest and most influential youth cult. He charts the origins of Mod in the Soho jazz scene of the 1950s, set to the cool sounds of Charlie Parker and Miles Davis. He explores Mod's heyday in Swinging London in the mid-60s - to a new soundtrack courtesy of the Small Faces, the Who and the Kinks. He takes us to the Mod-Rocker riots at Margate and Brighton, and into the world of fashion and design dominated by Twiggy, Mary Quant and Terence Conran. But Mod did not end in the 1960s. Richard Weight not only brings us up to the cult's revival in the late 70s - played out against its own soundtrack of Quadrophenia and the Jam - but reveals Mod to be the DNA of British youth culture, leaving its mark on glam and Northern Soul, punk and Two Tone, Britpop and rave. This is the story of Britain's biggest and brassiest youth movement - and of its legacy. Music, film, fashion, art, architecture and design - nothing was untouched by the eclectic, frenetic, irresistible energy of "Mod". Richard Weight is the author of Patriots: National Identity in Britain 1940-2000 and co-authored Modern British History: The Essential A-Z Guide. He studied history at Trinity College, Cambridge, and went on to do a PhD at University College, London. He is currently a Visiting Professor at the University of Boston and is a Fellow of the Royal Historical Society. Richard also makes documentaries for radio and television on many aspects of British life. 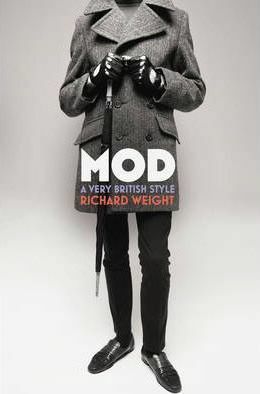 "MOD is an important book because it shows how a style so often dismissed as trivial is in fact an important determinant of Britishness... This is a great book because it has the courage to celebrate what is wonderfully modern"
Welcome to the world of the sharp-suited ‘faces’. The Italianistas. The scooter-riding, all-night-dancing instigators of what became, from its myriad sources, a very British phenomenon. Mod began life as the quintessential working-class movement of a newly affluent nation – a uniquely British amalgam of American music and European fashions that mixed modern jazz with modernist design in an attempt to escape the drab conformity, snobbery and prudery of life in 1950s Britain. But what started as a popular cult became a mainstream culture, and a style became a revolution. This is the story of Britain’s biggest and brassiest youth movement – and of its legacy. Music, film, fashion, art, architecture and design – nothing was untouched by the eclectic, frenetic, irresistible energy of Mod.